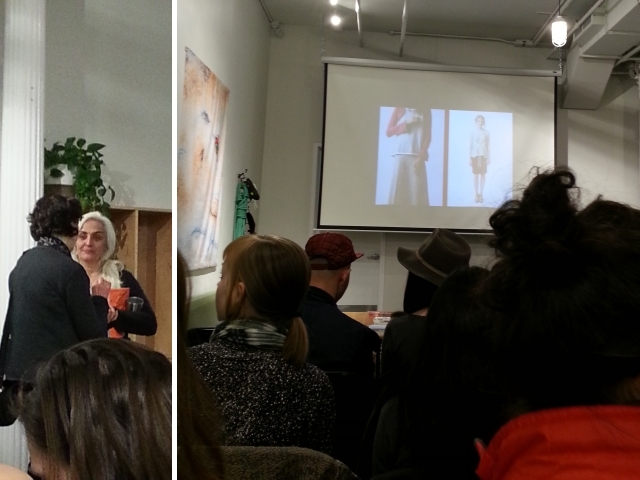 Thursday evening I was fortunate to attend a talk given by Natalie Chanin at the Patagonia store in SoHo. Natalie Chanin, founder/designer of Alabama Chanin, appearing across the street from me? How could I miss this event? My regret was that I was unable to attend the hand sewing workshop held earlier that afternoon, with proceeds benefiting the Uprose organization in Brooklyn. The evening talk, a question and answer session hosted by Jill Dumain, Patagonia's Director of Environmental Strategy, covered the inextricable topics of fashion, textiles, business, sustainability, and life. It ended with an all too brief period of questions from the audience. All in all it was a wonderful peek behind the scenes of Alabama Chanin, a responsible design and lifestyle company. Meanwhile, behind the scenes at O! Jolly! I'm in the middle of production and I have to admit to being slightly anxious at the moment. This is the time between viewing my sample fabric at the mill and having the actual finished product in my hands. I'm very excited knowing that my knitting is in progress. But... I've got to wait for it. In just a couple of weeks I'll be able to introduce two new sweater knits in the natural color-grown cotton line! It's been about a year since I first shipped my natural color-grown sweater knits. 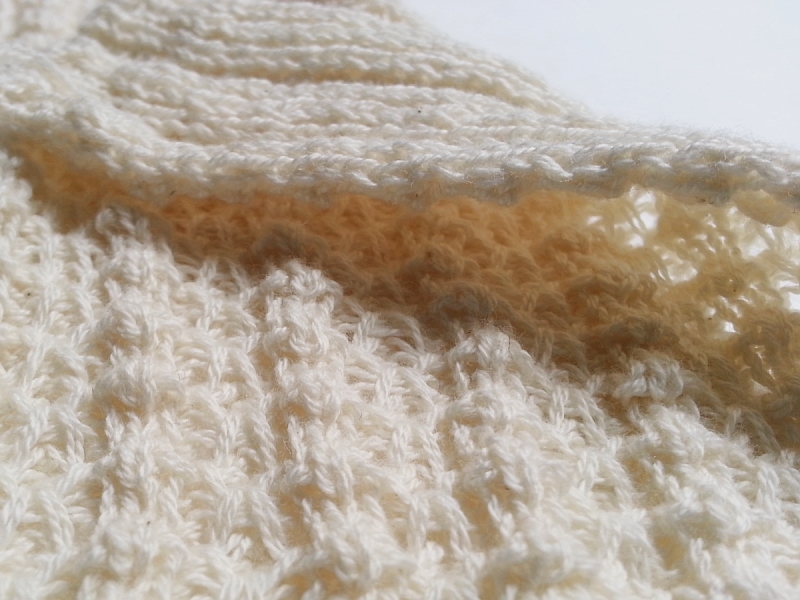 I'm thrilled to add a new textured knit in natural white (pictured above) and a new striped jersey in natural white and color grown light green (more about this new jersey in another post). So things are good! I'm just slightly impatient. My process started a couple of months ago with the idea for a new design. I knew I wanted to make another fabric with the yarn I first used last spring. This natural cotton yarn, made with fiber from the Sustainable Cotton Project is soft and springy, not dyed and not mercerized. (It's seriously soft. Though I rarely hand knit and never hand knit ordinary cotton, I would really hand knit this cotton yarn. It's just that soft.) 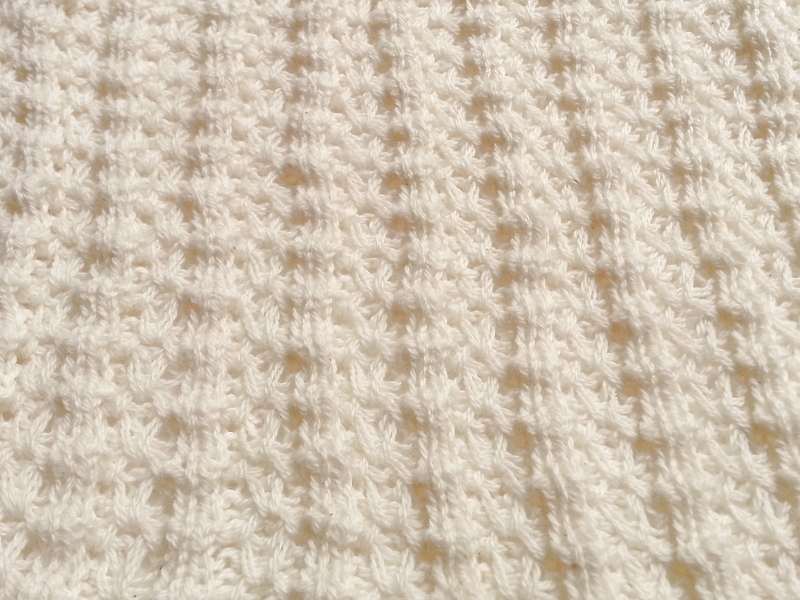 This year I wanted to produce a cotton fabric with more of a hand knit look, with lots of tuck stitches ("knit 2 below" as the hand knitters say), a little airy, and with a few baby knops for texture. Okay, lots of knops for texture. I imagine the perfect spring/summer cardigan. Yes, that is indeed the fun part -- dreaming up the general design, notating and knitting the stitch pattern on my knitting machine with the help of some really fab software, and editing as necessary. Part of the first iteration of the design is pictured below. My next step is to generate specs that are suitable to send the knitting mill. This particular fabric is being produced at Fleck Knitwear in nearby New Jersey. (See one of their Stoll knitting machines below.) 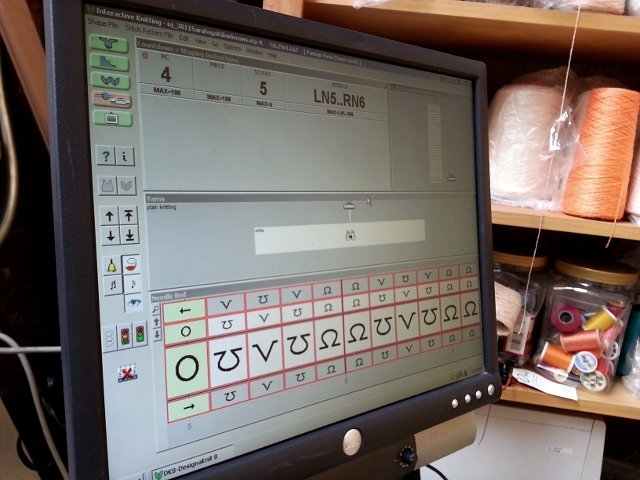 What's fantastic about having the fabric made so close to home is that once the knitting machine is programmed and set up to knit my design, I can actually be at the mill as the machine begins to knit the fabric. I'm able to inspect the fabric as it's being knit. The owner/technician can make any adjustments, if necessary, and I can give my approval right there. 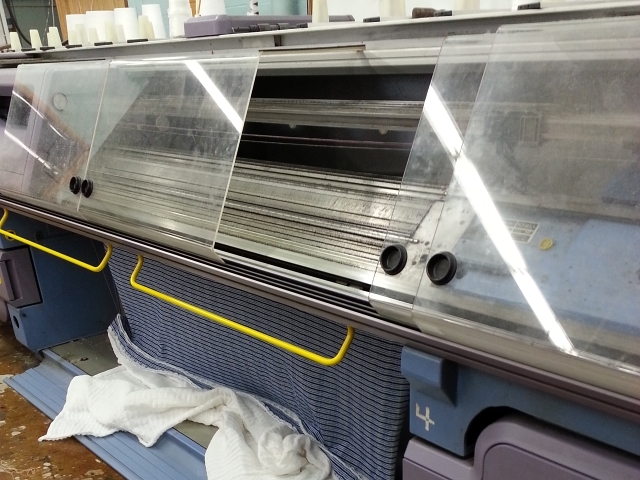 And just that easily and quickly the knitting machine can continue to with the production fabric. This is immensely more efficient and preferable to waiting several weeks for a knit sample to arrive from halfway around the world. Sometime soon the new O! Jolly! fabrics will arrive along with much yardage needed to replenish current inventory. If you're not already on the email list and you'd like to get word of upcoming special sales, events, and other good things, please join the email list now.